Weekend Wrap: Loewe 4K TVs, Amazon Fire TV, Blinkbox movies app | What Hi-Fi? From the confirmation that Loewe's range 4K Ultra HD TVs has now gone on sale in the UK to a new iPad app from Blinkbox that'll let you watch movies offline – here's all the news in brief from What Hi-Fi? 's Weekend Wrap. 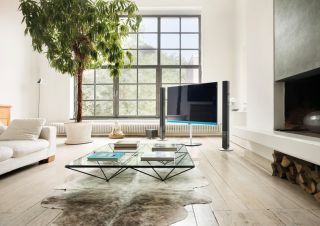 This weekend's news-bites [21st September] starts with the Loewe's Connect 4K Ultra HD range, which we first learned about earlier this month after the company was pulled back from the brink thanks to fresh investment. All models in the range come with 1TB of built-in storage and an integrated sound system that is equipped with Dolby TrueHD and DTS-HD surround sound. You can now get your hands on the sets at Harrods in London. Amazon has confirmed that its new streaming dongle, the Fire TV Stick, has started shipping – in the US, at least. It's the latest addition to the retail giant's video streaming range, following its set-top box sibling into the market. It costs $39 and Amazon believes it has the clout to take on rival products from Google and Roku, claiming more processing power and more memory than the other streaming sticks that you'll find on the market right now. If you're a Blinkbox subscriber, own an iPad and had been wondering when you would be able to watch your favourite films and programmes on your device – the wait is now over. Blinkbox has launched its new Movies iPad app, which lets you download content to your device and watch it whenever you want – meaning that you no longer need an internet connection. YouTube is continuing to take the rise of video streaming services seriously and has signalled its intent with the appointment of Netflix vice president of content acquisition, Kerry Merryman. Just days after unleashing its music streaming service on the taxi sector with its partnership with Uber, Spotify has now confirmed it's been added to the BMW ConnectDrive and Mini Connected App services.